It's 2018 and the world's favorite eyewear brand is all about mixing it up with larger than life looks that are not afraid to stand out. Dubai, UAE, May 06, 2018: On the front-line, Ray-Ban pulls out the big guns in a revolution of the brands most iconic shapes, conquering new territory without losing sight of its origins as the bravest of the lens makers: say hello to the new Ray-Ban Evolve collection. Revamping the cult profiles of The General, Aviator and timeless round shapes, as well as the one and only Wayfarer, innovative new photo-chromatic and washed color polar lenses show what it takes to be a true icon: accept the challenge, change. But the action is not all on the ground – the show-down is ready to light up the skies! Taking the inspirational appeal and absolute functionality of DNA Ray-Ban style to new heights, the original Wings shield shape brings a bold 80's evolution of the Aviator into the present with light gradient mirror shades and statement style. Made for rebellious high-flyers, this shout-out look blends iconic eras and profiles with pioneering confidence and an extravagant sense of fun for hedonistic brand lovers who are never afraid to challenge the norm. Keeping pace with the high-performance drive of contemporary life, the evolution continues with the groundbreaking look and feel of Liteforce. From functional to super, the paired down look of modern matt colors with advanced polar lens options and rubber grips give these ultra-light sun and optical shapes a head-start when it comes to race-winning style with hidden strength. 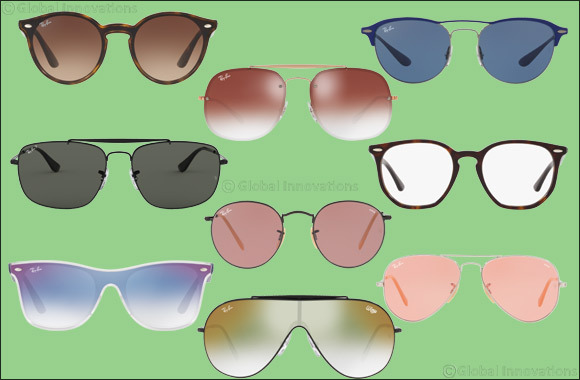 Closing out the highlights of the 2018 sun selection on a futuristic note, Blaze Evolution reboots the ultimate symbols of success with a fun, luminous new offer that is all about the edge - the Wayfarer and best seller panthos shape RB2180 go Blaze in contemporary matt transparencies and new light gradient shades for looks that literally travel through time in the blink of an eye. In the optical world, Ray-Ban introduces a defiant new selection for individuals who love to break the rules. Embracing the exchange of free ideas and identities, the iconic Aviator reinvents its own trend as a fresh semi-rim optical style while quirky hexagonal acetate profiles play with polished havanas to show-off the many angles of expressive go-getters. So there it is – dare to be who you want to be, and look like you mean it. RB3583N Never one to hide in the shadows, one of last year's hottest shapes makes its debut with a daring new edge - The General goes Blaze! Featuring the distinctive Blaze lens-over-frame construction and unmistakable flat metal double bridge and temples of the original General, three brand-new mirror gradient lenses in the collection, in addition to classic green and gradient options, make this look innovative in style and classic in appeal - a trailblazer for a generation of designs to come. RB4380N Blaze dares to shine brighter with super trendy shapes that have an edge on the rest. Building on the hot success of the launch series, this protagonist of Blaze features a new full-lens panthos shape in fresh matt transparent colors and new gradient mirror shades with contrasting temples for a contemporary profile, as well as classic Havana/gradient brown and black/solid green frame options for authentic appeal. RB4440N Get used to hanging out in the spotlight with a brilliant new take on one of the world's most famous shapes – the Blaze Wayfarer is here. The light, daring look of those who dare channels the essence of Ray-Ban with new matt transparent colors and light gradient mirror shades or classic black/green or light Havana / brown gradient variants, to show just how truly iconic design is always up for a change. Take the gamble, get the edge with clean-cut contemporary constructions on iconic design. RB3560 Ready for anything, the new rising star of “The General” family stands alone on the contemporary front. Redefining its DNA profile with a softer, square-edged shape and striking flat metal double bridge and temples of the original General, new shiny metal profiles and classic gradient lenses give The Colonel the look of someone who is always ready to take on the world in the impeccable style of a true icon. RB3547N This season, oval is the hottest thing on the rocks, and with an extra size, this distinctive sun shape is set to make the headlines. This larger oval sets a trend with one of a kind Ray-Ban style, flaunting fine metallic tones with flat lenses in classic G15 and gradient shades for distinguished appeal with a contemporary feel. Now available in size 54. RX3547V An effortlessly cool oval-shaped frame with clear prescription lenses available in contemporary combinations of classic golden metal profiles on top Havana or black and silver on top blue. RB3597 The original Wings is back in luminous new shades. Pairing the free-spirited image of Ray-Ban stars with contemporary self-expression, the relaunch of this epic shape puts the icon back into stand-out style. With its bold, oversize shield shape, fine flat metal temples and upper bridge and unique one-piece nosepad, Wings is made to transition from the race track to the dancefloor without breaking a sweat. Choose from gold, black, silver or gunmetal frames with clear gradient mirror shades or classic brown gradient or dark green lens options, all with the legendary Wings logo engraved on the lens for exclusive style. RB3561 Always up for a challenge, the pioneer of lens making gives one of its most authentic icons a trendsetting new look with exciting washed p enses. Pairing the iconic flat metal bridge and temples in black, gold, silver or gunmetal with brand new polarized lenses in pastel shades of blue, yellow, violet and grey to create an eye-catching see-through effect that gives iconic style an irresistible new look. RB3025 Never afraid to accept a dare, the one-of-a-kind Ray-Ban Aviator evolves with brand new lightsensitive Evolve lenses. With the timeless appeal of a true icon, and irresistible track record as a best performing shape, this original pilot comes in iconic gold, silver and black frames with four pastel lens tones – pink, purple, orange and gray – that adapt to brighter light conditions by changing from see-through to more intense tones. RB3447 Boasting the title of one of last year's top sellers, this successful round metal icon now hits the top of the list as a proud protagonist in the new Evolve lens story. Flaunting four new washed pastel shades on flat lenses, matched to fine metal frames this is a look that goes around the clock in truly timeless style. RB2140 One of a kind, the original Wayfarer takes a contemporary view on iconic style, pairing vivid colors paired with shiny Havana temples and new polarized lenses in washed tones of yellow, purple, blue, and gray for a trendsetting look. Choose from orange, green, blue or red frames with tone-matched colored Havana temples and new lenses for a total color look. RX6589 Light, yet unmistakable, the original Aviator inspires a brand new contemporary optical shape. Despite its super fine semi-rim metal shape with fine flat metal temples, this optical style still makes a statement, channeling the look of an authentic design into a new icon in the making. Available in signature metal colors as well as rich black and Havana tones, and two highvolume sizes (56 & 59) for a super light, yet larger than life look and feel. RX7151 Savvy and sensational, the slim profiles of this new acetate optical shape gives the best performer hexagonal shape a whole new look with street-smart angles and a vintage-chic keyhole bridge. Iconic rivets and metal letter temple logos make sure it is 100% Ray-Ban. Make the choice from classic and colored havanas or refined striped colors, with matching or bi-color nylon temples for a light, perfectly balanced fit and absolute style. RB4296 Revolutionary performance means total functionality with absolute style – and the new Liteforce generation has it covered. Defined by its ultra-light, ultra-strong frame, the now even finer profiles of this perfect panthos get cool matt colors and gradient shades for essential style, while solid polarized lens options and impact absorbing rubber temple tip grips make sure it is optimized to the max. RB3596 Groundbreaking aerospace technology and a dynamic new temple design inspire this debut metal & Liteforce combination frame featuring a contemporary wide-set round metal shape with a fine double bridge and super thin Liteforce temples. Contrasting brows and rims in matt / metal combinations get either matching or contrasting temples and gradient, gradient mirror or solid polar lens options for an incredibly sleek look that is all about winning. RX3596V Smart and sleek, this optical spin-off of a first-time metal-Liteforce combination sun frame gives featherweight optical design a high-definition profile with fine color detailing and hidden strength. Featuring an ultra-fine flat metal shape with a trend-aligned double bridge and the thinnest ergonomically designed Liteforce temples ever, this unique style is sure to catch an eye or two, and will never give up. Choose from a selection of 5 matt metal and color combinations with tone matched solid temples for a refined, yet hard-to-miss look.